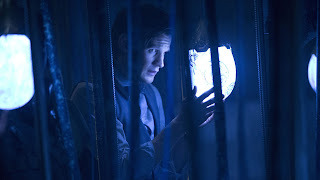 Beyond Fandom: 'Doctor Who' Review - 710 "Journey to the Centre of the TARDIS"
'Doctor Who' Review - 710 "Journey to the Centre of the TARDIS"
Hold onto your fezzes, we’re about to take a Journey to the Centre of the TARDIS! The story of the Van Baalen brothers (was anyone else digging the whole Firefly/Cowboy Bebop vibe their operation was giving off?) 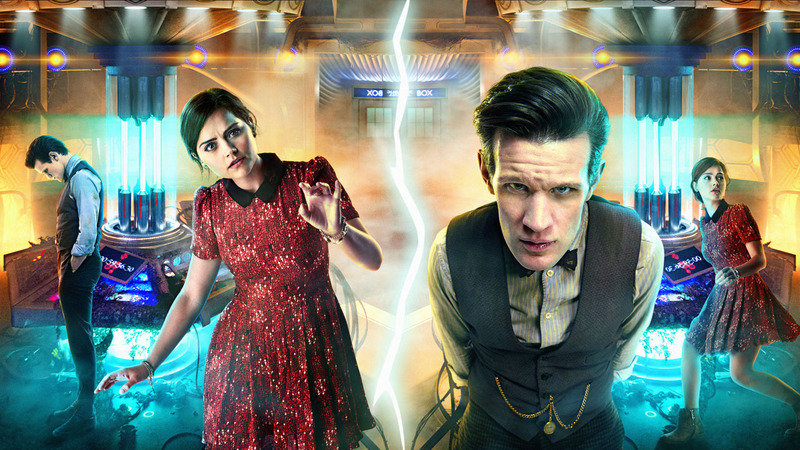 and of the Doctor and Clara definitely echo each other. The younger Van Baalen brother loses his sight, voice, and memory in a salvage accident so the other brothers decide to tell him he’s an android for their own amusement. The brothers keeping the truth from him is a dangerous secret much like how the Doctor hiding what he knows about Clara from her. The truth is messy, hard, and for both characters it’s easier to keep these secrets from them until danger strikes. I’m wondering if the Doctor will tell Clara the truth before the end of the season? Sure, he does in this episode, but time is reset and everything that happened is now gone. Or is it? It seems like some echos of the events have stuck on its participants, so Clara might remember more than she’s letting on at the end of the episode. But since the Doctor told her forgetting his name and what she saw in the book on the Time Wars , it would be best that she’s probably not letting it on. We can’t forget about the monsters of the week and this week’s monsters are still giving me chills as I write this. The monsters weren’t even monsters per se, instead the Doctor, Clara, and the Van Baalen Brothers mutated from the dying star that powers the TARDIS in a variation of the current timeline. Thanks to the memory leak that was showing them pieces of the past it was also leaking the future in as well, so Clara was running from the Doctor and herself for most of the episode. She still has a long way to go to match Rory for most deaths, but at this rate I think she could get there. 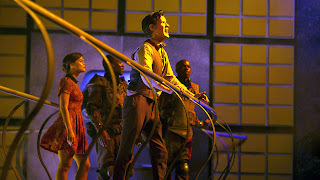 Speaking of past companions we got quite a few nods to them and the Doctor’s past adventures in this episode. One of the rooms we got a glimpse of was a storage room of sorts with all sorts of easter eggs inside. Including one of the many TARDIS models a young Amy made, the Doctor’s crib, and an umbrella. I want to say it’s the same umbrella from the Christmas Special this year, so Clara would be unknowingly handling something from her past, but I’m not sure. If anyone knows exactly what it’s from, or if it’s just an umbrella be sure to let me know. We also got echoes of past conversations when one of the Van Baalen brothers prys off a part of the console. It’s the 50th anniversary year everyone; smell it, taste it, enjoy it. I have a feeling that this episode is going to be in important one to look back on later in the season, that it may hold some secret that will be important later on. Especially because Clara, at least the Clara before time was reset, knows the Doctor’s name. 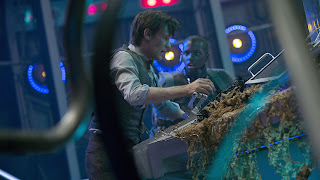 Now this all seems a bit sloppy on the Doctor’s part, leaving that book out in the open where she could get in and read it at any time really, but I’m starting to think there’s something deeper at play here. Throughout this second part of the season Clara has claimed that the TARDIS doesn’t like her and this seems to be the case because we believe she’s some sort of time anomaly. But what if the TARDIS is trying to save her? The TARDIS was moving things around at this point in the story already so it helped guide her back to the safety of the console room. If it really hated her, couldn’t it have just as easily have her be lost forever? It also stands to reason that it could have moved that book where Clara could find it so she could read it. Aside from the Doctor’s real name, what else was in that book that the TARDIS thought Clara should see?